Streetfilms | Exploring More of The Netherlands: Rotterdam, Nijmegen, Arnhem & more! By now you may have seen a few of my newest Streetfilms debuting from my visit to The Netherlands for the Velo City 2017 conference. The above video is a great resource in case you've ever wanted an on-the-ground tour of cycling by Dutch engineers but haven't the opportunity to do so. It's difficult capturing events like this in real time while moving with a group, but there is certainly enough to soak up in this Streetfilm and learn a great deal about logical design for cyclists and intersections from the best, so check it out. I saw much on this journey spending time in a few cities. 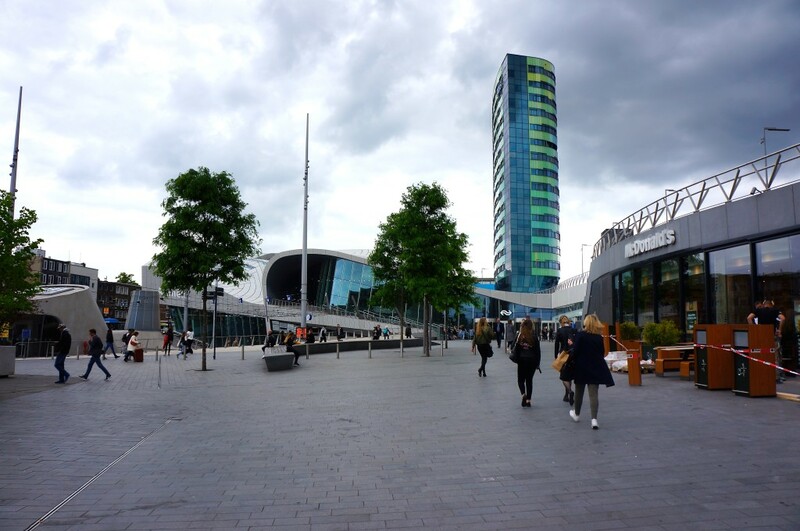 My first stop - unexpectedly - was the city of Rotterdam. When a vocal group of Twitter followers from Rotterdam found I was spending an extra day in the Netherlands (to save big time on my roundtrip airfare) they cajoled me into an amazing tour. José Besselink, Urban Planner for the City of Rotterdam, and Monique Zwinkels, Inner City Manager, Municipality of Rotterdam organized a fabulous journey by bike to sample some of what the city has to offer, especially looking at its core urban livability concept City Lounge. We had a few fun moments I was able to pop up quickly while on the road. The above is kinda silly, but shows my great love for transit running over grass. It's something I have also experienced in Oslo and Cambridgeshire (buses); there's just something about it that brings out the kid in me. And it jives with my son, since he loves the video too. This next video speaks to the testament about how much more dense cities all over the world are getting and how cars are becoming increasingly a bad technology to use in cities. The ANWB, which you can think of as the Dutch AAA car-federation for motorists, now has a fleet of cargo bikes they use to rescue or fix driver cars in the central city of Rotterdam. They had only been operating a few days when we ran into this gentleman. Oh, and also they will fix bikes, too. And a final bit. Have seen on-line many musical staircase installations around the world, but this is the first I got to see live and walk up! And another note. Look it is me in action thanks to Jose! I don't get very many photos of me in action so always grateful. The Velo-City 2017 conference itself was great and you'll see a few moments at the beginning of the video up top. I also got to ride the Bike Superhighway between Arnhem-Nijmegen (see below) which was such a smooth, peaceful, direct ride that 18 km flew by quickly. As Sjors Van Doren, Program Director for Velo-City points out in our video, "When people are at ease, time goes faster.” So true. I often ride 18kms to work in NYC, and though the ride keeps getting better, some days it can feel like a very long journey. 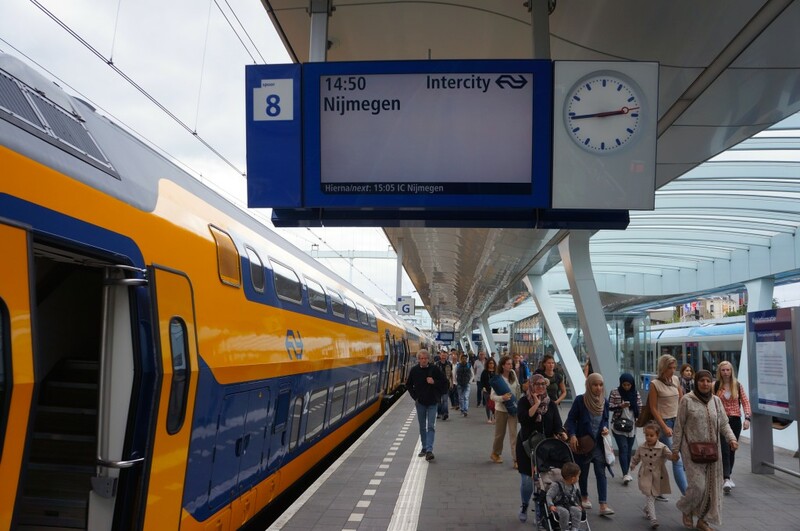 While at the conference, I ended up needing to stay in Arnhem which was only either an 18km superhighway bike ride away (see above) or one of five trains per hour via the Centraal Station which averaged only about 15 minutes. Always on time, always clean and beautiful. 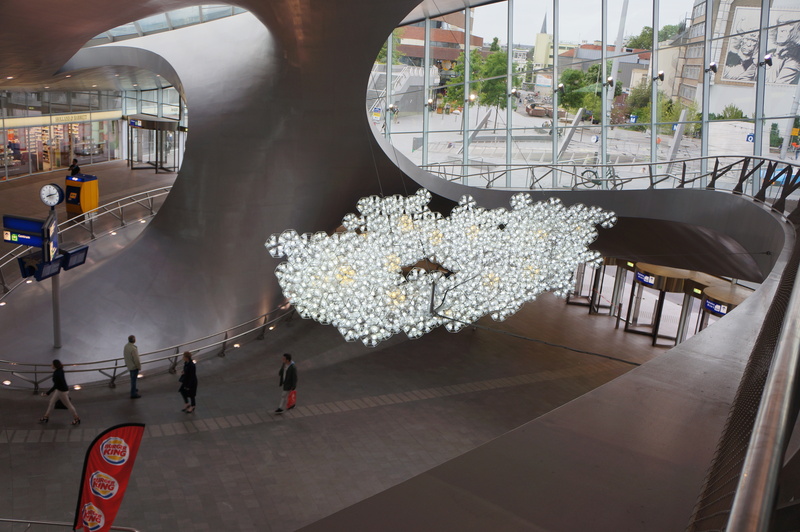 The station in Arnhem is a place of stunning beauty and prominence (Rotterdam's was too) that I wanted to share some photos of. My hotel was directly opposite the street (when traveling for Streetfilms I always stay as close to train lines as possible) and I spent a few nights just wandering the futuristic complex and adjoining public spaces. I could see a sci-fi film being shot here, but haven't been able to find one! What??! Someone needs to do this ASAP! Anyway, I'm hard at work going thru 1538 clips of my journey to prepare two more comprehensive videos, one on Rotterdam and one from Nijmegen. They'll be great, look for them! Posted in Bicycles, Car-Free, Streetfilms News. 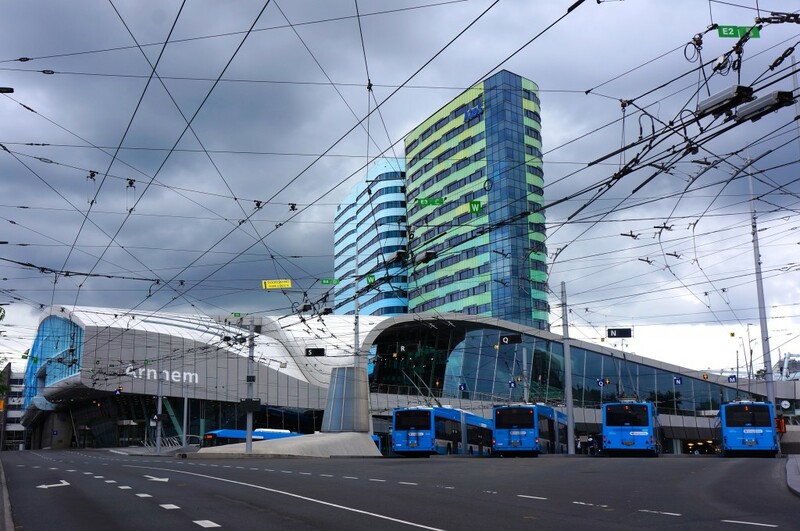 Tagged as Arnhem, Arnhem - Nijmegen, Bicycling, Bike Parking, bike superhighway, Netherlands, Nijmegen, protected bike lanes, Rotterdam, The Netherlands, trams, Transit, Velo City 2017.